On Friday the London 2012 Olympic Games started with a fantastic Opening Ceremony, marking the culmination of the 70 day Olympic Torch Relay and the beginning of nearly seven weeks of sporting and cultural celebration. That the Olympic Torch Relay was such a great success from start to finish is in no small part down to the hard work and planning of every officer and police staff member involved in the various policing operations up and down the country. I would like to express my gratitude to every officer and staff member who has played a role in its delivery. The National Olympic Coordination Centre (NOCC) has been up and running since May and the coordination centre’s multi-agency desks are working 24/7 to keep all partners, including Government, up-to-date with the safety and security operations of the Relay and Games. As you are well aware, one of the largest pieces of work we have had to undertake ahead of the Games was the resourcing of the policing operation. The Police Service continues to step up to the plate to ensure the Games are a success, with 52 forces playing their part in delivering the safety and security operation – this incredible contribution has been made all the more challenging by G4S shortfalls. I am well aware that many thousands of officers are spending time away from home while serving on mutual aid or assisting in venue security. Despite this, I am confident that our officers and staff will continue to display the utmost professionalism on duty. In the last few weeks, London has been transformed into a stage dressed to host the World’s greatest sporting events and it’s great to see officers from up and down the country in the Capital, policing the streets and welcoming visitors. Every officer I’ve come across, no matter where they are from, has been both helpful and welcoming to the public, not to mention excited to be part of such an iconic event in our history. All of those who I have come across seem to be enjoying the buzz on the streets of London at the moment. All of our 11 Olympic venue forces, and British Transport Police, are working hard to ensure the successful delivery of the Games. I’d like to recognise the work of the Games command teams and planners who after years of preparation, are now not only experts in various fields of sports, but are also delivering excellent policing operations. We all continue to play a critical role in ensuring that while the eyes of the world are upon us, the Games and our communities at home will be kept safe and secure. A successful Games will need every ounce of the usual hard work and dedication to duty which make the British Police service the envy of the world. I remain confident that once again all partners will deliver fantastic events across venue forces, showcasing Britain and the police service to the world and I thank you all for your continued assistance and support. 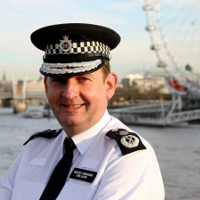 Chris Allison, National Olympic Security Coordinator, is Assistant Commissioner in the Metropolitan Police Service and Head of the ACPO Olympics Business Area.